In association with Amazon, we ship pressure cooker cookbooks to anywhere in the U.S. or Canada. Pressure cooker cookbooks at low, low prices. 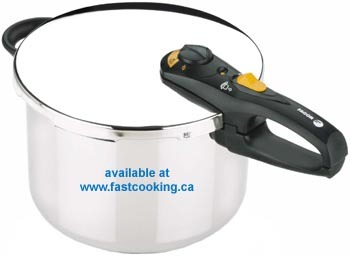 We also ship pressure cookers to anywhere in Canada (Toronto, Montreal, Vancouver, Ottawa, Edmonton, Calgary, Winnipeg, Halifax or anywhere else). Lorna Sass: Lorna Sass is an award-winning author of many cookbooks including the groundbreaking Cooking Under Pressure (below) and is credited with reviving enthusiasm for the pressure cooker. Fans of Lorna's innovative vegan cooking all agree that she has a great talent for combining flavours, textures and colours to create food that tastes as good as it looks. Applying her expertise as a leading authority on the pressure cooker, Lorna frequently offers directions for using this time-saving appliance alongside standard cooking instructions. With menu-planning tips, and an extensive glossary of ingredients, this cookbook is for anyone seeking a healthy new definition of fast food. Pressure cooker cookbooks are sold here: suitable for Fagor, Kuhn Rikon, T-Fal, Presto and other pressure cookers. Buy your cheap pressure cooker cookbooks online here for Magefesa, Fissler, Lagostina. ©2005-2007 Circular Input Products Ltd., All Rights Reserved. Problems or suggestions about website: contact .